To hear a firsthand account of one of the last remaining Holocaust survivors is a deeply profound experience. 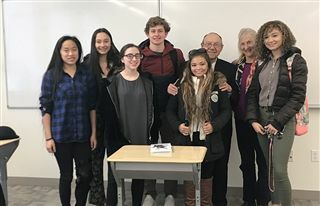 On Tuesday, January 15, Rabbi Philip Lazowski spoke to Stacey Savin’s International Human Rights class about his survival during the Holocaust in Russia and the incredible strength of the human spirit. Lazowski was born in 1930 in the small town of Bielica (present-day Belarus). When the Germans invaded Russia in June of 1941, German forces marched into his hometown and began their mass extermination of the Jewish population. The quick-witted 11-year-old helped hide his family in a cave he had built under their home. However, returning to their hideout one day, a German soldier caught Lazowski and forced him to the marketplace where a selection was taking place. Separated from his family, he asked several women if he could pretend to be their son. One woman with two young daughters took him as her son, and he was able to return to his family’s hideout. This semester students have been learning about the Holocaust as well as other genocides, human rights, and current events. 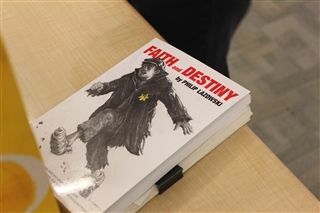 As part of a recent assignment, students read one of the rabbi's 14 books, Faith and Destiny, and his visit was a chance to both hear his story and ask questions. Many of their questions stemmed around the incredulous nature of how he was able to continue on and find the will to live, despite what seemed like an inevitably bleak future. The rabbi was poignant and thoughtful in his answers, his voiced tinged with a Slavic accent, pausing almost as if to pick the exact words to describe the heavy burden he felt was his calling and responsibility to explain. He ultimately boiled it down to one thing. After being discovered in their underground cave, Philip and his family were forced into a theater in their town where they heard the soldiers coming. Lazowski said, “Hearing the trucks meant there would be another massacre”. Knowing they would likely be killed, his mother told him to jump out a second story window to give her son a chance at survival. He somberly recounts telling her "no" and pleading with her to jump as well. At the time she was holding his younger siblings and therefore could not jump herself. Taking a chair, she broke a window and pushed him out where he fell, next to another young boy, and together they escaped. 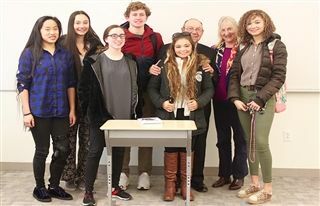 She and his three younger siblings would not survive the Holocaust but Lazowski, his younger brother and father would, hiding out in the woods for two years before eventually making their way to the United States. Lazowski has worked tirelessly with Congress to create legislation that calls for schools to teach the atrocity of the Holocaust, as well as other massacres that have taken place over the course of history. His efforts have finally paid off. This year schools across the country will teach genocide in their lessons. After escaping the Nazis and fleeing to the United States in 1947, he continued his education at Brooklyn College. While attending a friend’s wedding, he met a young woman who told him about a family in Hartford, Connecticut that had once saved a boy from Bielica. Lazowski knew he was that boy. The rabbi's comments should remind us of who we are and who we can be collectively - that justice and righteousness need to form our moral center.